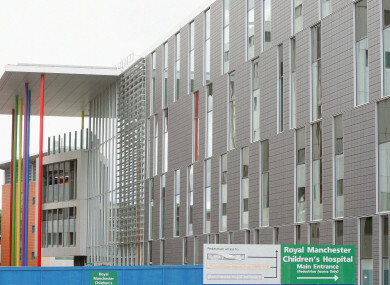 The allegations relate to Lewis' time at Royal Manchester Children’s Hospital. AN ENGLISH CONSULTANT working in two Dublin children’s hospitals has been before a fitness to practise hearing in the UK after he was found to have had inappropriate contact with the mother of a patient while working in Manchester. Dr Malcolm Lewis has been employed as a paediatric consultant nephrologist in both Temple Street Children’s Hospital and Our Lady’s Children’s Hospital Crumlin since August 2016. A spokesperson for Temple Street said that Lewis ceased employment in Royal Manchester Children’s Hospital in the same month he began working in Temple Street and Crumlin. On his retirement from the hospital in Manchester, parents took to the hospital’s Facebook page to describe the positive experiences their children had under his care. A complaint was made against him in the UK a number of months after he began working in Dublin, and Lewis informed his Irish employers of this. Lewis provided Temple Street and Crumlin with the details of the complaint as provided to the UK’s General Medical Council and a decision was taken that he remain employed at the Irish hospitals pending the outcome of the tribunal. A UK medical tribunal was heard between 18 February – 1 March and is due to resume on 17 September. The tribunal heard details of allegations against Lewis and made findings of fact in relation to them. Among the allegations were that Lewis used his professional position in the hospital to pursue an inappropriate relationship with the mother of a patient. The teenager in question had undergone a failed kidney transplant in which the mother had been the donor. The tribunal found that it was proven that Lewis had inappropriate contact with the mother by meeting her outside hospital grounds to discuss her child’s treatment, and that he had also accessed the child’s blood test results and conveyed them to the woman. During this period, Lewis was not the child’s treating consultant and it was also found by the tribunal that he had sent a gift to the patient’s address. Lewis gave evidence in person during the tribunal and was found to be a “credible witness”. The tribunal said that he “accepted elements of the charges but remained consistent that his actions were not inappropriate”. “The Tribunal found that he gave careful and considered responses to the questions put to him,” the tribunal stated in its determination of the facts. However, the Tribunal found Dr Lewis less convincing in his responses to Tribunal questions. In particular, he did not provide satisfactory explanations as to the appropriateness of maintaining a friendship with a parent of a patient. The tribunal noted testimonial evidence on behalf of Lewis suggesting that he “routinely provided patients with his personal details at the outset to the parents of seriously ill patients”. The tribunal also determined that it was “more likely than not” that the interactions between Lewis and the mother began when they “bumped into one another” in the hospital. In a response to TheJournal.ie, a spokesperson for Temple Street said Lewis had provided the hospital with documentation regarding the findings from the completed stage of the hearing. “Dr Lewis has been found to have continued to communicate with the family in question after ceasing to be their treating consultant,” the statement said. The tribunal will reconvene between 17- 19 September to consider whether the doctor’s fitness to practise is impaired. Email “Consultant at Dublin children's hospitals had inappropriate contact with patient's mother in UK, tribunal hears”. Feedback on “Consultant at Dublin children's hospitals had inappropriate contact with patient's mother in UK, tribunal hears”.